Dimensões desta antevisão em PNG do ficheiro SVG: 569 × 599 píxeis Outras resoluções: 228 × 240 píxeis | 456 × 480 píxeis | 570 × 600 píxeis | 729 × 768 píxeis | 972 × 1 024 píxeis | 848 × 893 píxeis. English: Track map for Hungaroring. The color dashed lines are the Formula 1 sectors. Magyar: Pálya térkép Hungaroringen. A szín szaggatott vonalak a Forma-1-ágazatban. JPG showing the 2003 layout. JPEG was used mainly for looks. Shows only the layout and the length. 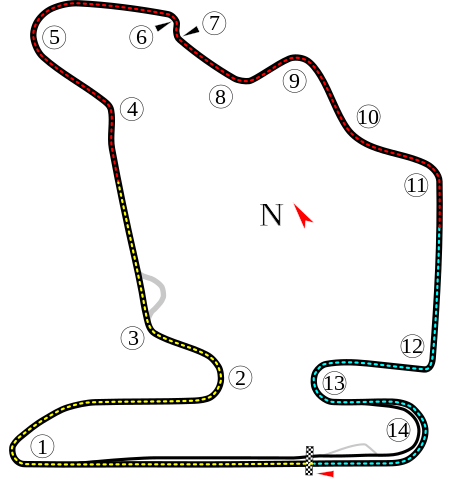 Same as Image:Hungaroring 2003.jpg, but showing the 1999 layout. JPG showing just layout and some turn numbers. Date unknown, however, it is missing some turns.